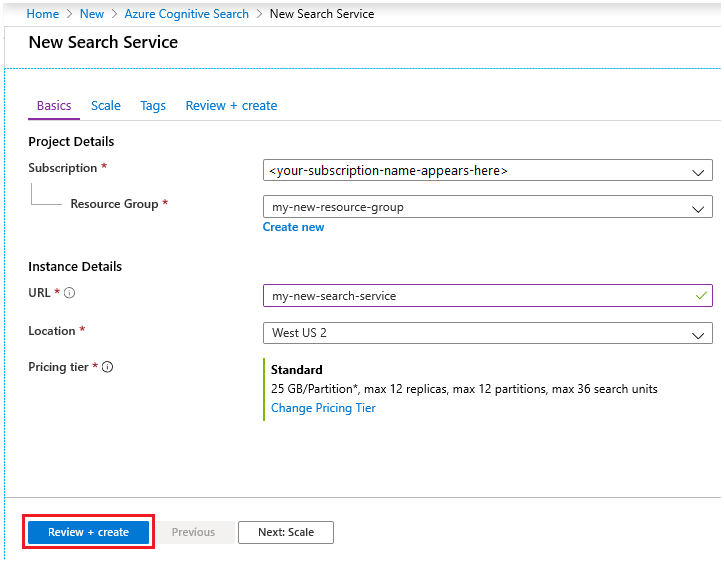 Azure Search is a standalone resource used to plug in a search experience in custom apps. Although Azure Search integrates easily with other Azure services, you can also use it by itself, with apps on network servers, or with software running on other cloud platforms. In this article, learn how to create an Azure Search resource in the Azure portal. Prefer PowerShell? Use the Azure Resource Manager service template. For help with getting started, see Manage Azure Search with PowerShell. Open a free Azure account and use free credits to try out paid Azure services. After credits are used up, keep the account and continue to use free Azure services, such as Websites. Your credit card is never charged unless you explicitly change your settings and ask to be charged. Alternatively, activate MSDN subscriber benefits. An MSDN subscription gives you credits every month you can use for paid Azure services. Click the plus sign ("+ Create Resource") in the top-left corner. Use the search bar to find "Azure Search" or navigate to the resource through Web > Azure Search. A service name is part of the URL endpoint against which API calls are issued: https://your-service-name.search.windows.net. Enter your service name in the URL field. For example, if you want the endpoint to be https://my-app-name-01.search.windows.net, you would enter my-app-name-01. If you have more than one subscription, choose one that also has data or file storage services. Azure Search can autodetect Azure Table and Blob storage, SQL Database, and Azure Cosmos DB for indexing via indexers, but only for services in the same subscription. A resource group is a collection of Azure services and resources used together. For example, if you are using Azure Search to index a SQL database, then both services should be part of the same resource group. If you aren't combining resources into a single group, or if existing resource groups are filled with resources used in unrelated solutions, create a new resource group just for your Azure Search resource. Deleting a resource group also deletes the services within it. For prototype projects utilizing multiple services, putting all of them in the same resource group makes cleanup easier after the project is over. As an Azure service, Azure Search can be hosted in datacenters around the world. Prices can differ by geography. If you are indexing content located in an Azure service (Azure storage, Azure Cosmos DB, Azure SQL Database), create your Azure Search service in the same region as your data to avoid bandwidth charges. There are no charges for outbound data when services are in the same region. Azure Search is currently offered in multiple pricing tiers: Free, Basic, or Standard. Each tier has its own capacity and limits. See Choose a pricing tier or SKU for guidance. Standard is usually chosen for production workloads, but most customers start with the Free service. A pricing tier cannot be changed once the service is created. If you need a higher or lower tier later, you have to re-create the service. Remember to pin your service to the dashboard for easy access whenever you sign in. With few exceptions, using your new service requires that you provide the URL endpoint and an authorization api-key. Quickstarts, tutorials such as Explore Azure Search REST APIs (Postman) and How to use Azure Search from .NET, samples, and custom code all need an endpoint and key to run on your particular resource. In the service overview page, locate and copy the URL endpoint on the right side of the page. In the left navigation pane, select Keys and then copy either one of the admin keys (they are equivalent). Admin api-keys are required for creating, updating, and deleting objects on your service. An endpoint and key are not needed for portal-based tasks. The portal is already linked to your Azure Search resource with admin rights. For a portal tutorial, start with Tutorial: Import, index, and query in Azure Search. It can take a few minutes to create a service (15 minutes or more depending on the tier). After your service is provisioned, you can scale it to meet your needs. Because you chose the Standard tier for your Azure Search service, you can scale your service in two dimensions: replicas and partitions. Had you chosen the Basic tier, you can only add replicas. If you provisioned the free service, scale is not available. Partitions allow your service to store and search through more documents. Replicas allow your service to handle a higher load of search queries. Adding resources increases your monthly bill. The pricing calculator can help you understand the billing ramifications of adding resources. Remember that you can adjust resources based on load. For example, you might increase resources to create a full initial index, and then reduce resources later to a level more appropriate for incremental indexing. A service must have 2 replicas for read-only SLA and 3 replicas for read/write SLA. Go to your search service page in the Azure portal. In the left-navigation pane, select Settings > Scale. Use the slidebar to add resources of either type. Each tier has different limits on the total number of Search Units allowed in a single service (Replicas * Partitions = Total Search Units). Most customers use just one service provisioned at a tier providing the right balance of resources. One service can host multiple indexes, subject to the maximum limits of the tier you select, with each index isolated from another. In Azure Search, requests can only be directed to one index, minimizing the chance of accidental or intentional data retrieval from other indexes in the same service. Disaster recovery (data center outage). Azure Search does not provide instant failover in the event of an outage. For recommendations and guidance, see Service administration. Your investigation of multi-tenancy modeling has determined that additional services is the optimal design. For more information, see Design for multi-tenancy. For globally deployed applications, you might require an instance of Azure Search in multiple regions to minimize latency of your application’s international traffic. In Azure Search, you cannot segregate indexing and querying workloads; thus, you would never create multiple services for segregated workloads. An index is always queried on the service in which it was created (you cannot create an index in one service and copy it to another). A second service is not required for high availability. High availability for queries is achieved when you use 2 or more replicas in the same service. Replica updates are sequential, which means at least one is operational when a service update is rolled out. For more information about uptime, see Service Level Agreements. After provisioning an Azure Search service, you can continue in the portal to create your first index.